HONG KONG – (ACN Newswire) – NetDragon Websoft Holdings Limited (“NetDragon” or “the Company”; Hong Kong Stock Code: 777), a global leader in building online communities, is pleased to announce that “The Fourth US-China Smart Education Conference” was successfully held at the University of North Texas on 18 March 2019. It was co-hosted by Beijing Normal University, University of North Texas and National Engineering Laboratory for Cyberlearning and Intelligent Technology, and co-organized by Smart Learning Institute of Beijing Normal University and the College of Information of University of North Texas. In attendance were experts and scholars from the Ministry of Education of China, United States Department of Education, all levels of educational administration, eminent colleges and universities and research institutions, as well as senior executives and representatives of well-known information technology companies in China and the United States. As a partner of National Engineering Laboratory for Cyberlearning and Intelligent Technology and Smart Learning Institute of Beijing Normal University, NetDragon has participated in this conference for four consecutive years. 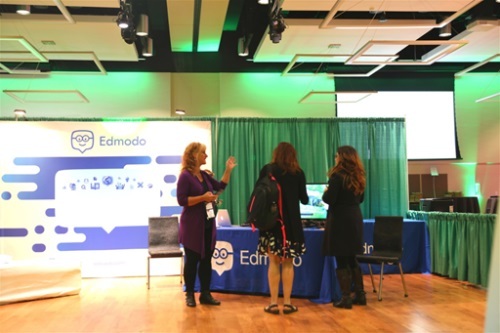 In the conference this year, NetDragon presented its global online education platform, Edmodo, which demonstrates NetDragon’s experiences and achievements in digital education in the past years, as well as bringing new practices and ideas to the development of the industry.